The global development of certain types of renewable energy sources—wind, wave, solar, geothermal, biofuel, waste-to-energy, and tidal energy—represents a positive move away from more traditional, non-renewable sources, especially fossil fuels. Fossil fuel resources are in finite supply, and developing and producing those resources can result in considerable impacts on the environment and human health. Burning fossil fuels produces carbon dioxide and other greenhouse gases that contribute to climate change. Increased production of renewable energy is intended to address the nation’s longstanding goal of reduced dependence on foreign energy sources. The Marine Mammal Commission supports efforts to develop offshore renewable energy. Nevertheless, as with any new industrial activity proposed in U.S. coastal and offshore waters, the Commission believes that the development of alternative energy sources should proceed in a thoughtful and deliberate manner. Primary concerns with regard to offshore renewable energy focus on potential impacts on marine mammals from geological and geophysical surveys that are used to assess the suitability of offshore sites for development and from the construction, operation, and decommissioning of renewable energy facilities in coastal and offshore waters. The Commission’s 2010–2011 annual report and 2012 annual report provide summaries of offshore renewable energy development in the United States and the associated impacts on marine mammals, as summarized below. The MMPA established a moratorium on the taking of marine mammals in U.S. waters. It defines “take” to mean “to hunt harass, capture, or kill” any marine mammal or attempt to do so. The Commission regularly reviews and comments on the Bureau of Ocean Energy Management (BOEM) and the Federal Energy Regulatory Commission (FERC) proposed renewable energy activities and on proposed Marine Mammal Protection Act (MMPA) incidental take authorizations in all Outer Continental Shelf (OCS) planning areas. We also comment on and promote environmental studies to better understand the potential effects of renewable energy development on marine mammals. In March 2017, we participated on an expert panel convened by the BOEM to develop best management practices to guide the construction and operations of critical offshore infrastructure. The panel discussed the potential impacts of wind turbine construction, such as noise from pile driving and increased vessel traffic, on North Atlantic right whales and other marine mammal species. Mitigation and monitoring strategies were identified that could reduce impacts and fill key data gaps. Find out more about the workshop and view presentations here. 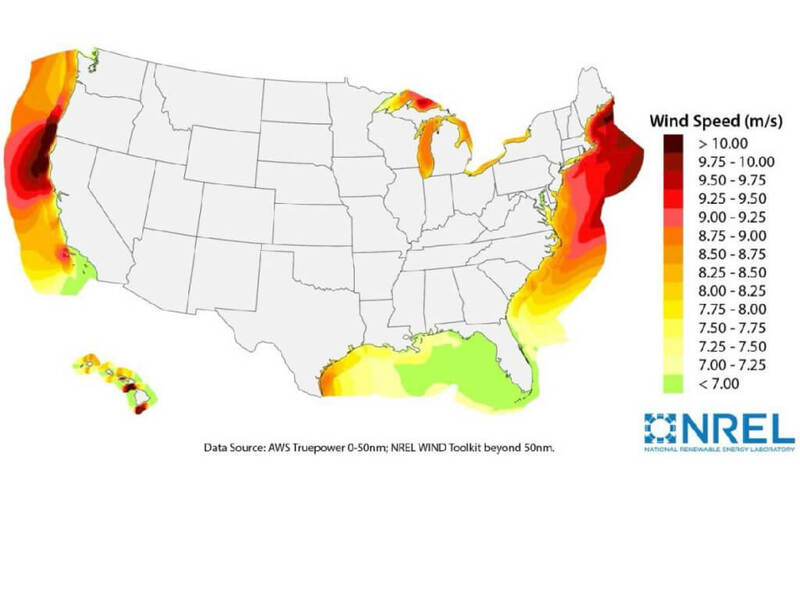 Wind is a potentially large source of renewable energy from offshore waters. Offshore wind resources are more abundant, stronger, and more consistent than land-based wind resources. To meet growing interest in offshore wind development, BOEM has issued or is reviewing lease requests or nominations for wind energy development in the Atlantic Ocean off Massachusetts, Rhode Island, New York, New Jersey, Delaware, Maryland, Virginia, North Carolina, and South Carolina, and in the Pacific Ocean off California and Hawaii. 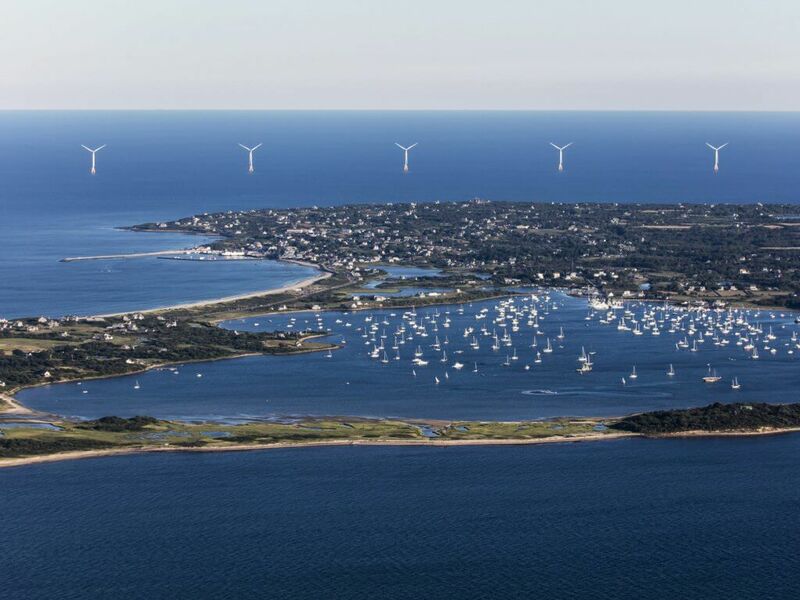 The first offshore wind farm in the United States began operations in December 2016, near Block Island off Rhode Island. It has five turbines installed that can generate 30 megawatts of energy. See BOEM’s renewable energy website for state-by-state information on the status of wind energy development in U.S. offshore waters. The development of offshore wind energy involves technology that is just beginning to be installed in U.S. OCS waters. Monitoring of wind farm construction and operation activities at various wind energy facilities outside the U.S. (primarily in the European Union) can provide some useful information regarding potential impacts of wind farms on marine mammals and seabirds. However, because of the different species involved and the potentially different wind turbine designs that may be installed in the U.S., some uncertainty exists regarding the potential short- and long-term impacts of offshore wind development on marine mammals that occur in U.S. waters (such as North Atlantic right whales). In general, more information is needed regarding impacts over the full life-cycle of wind energy activities as well as the cumulative adverse effects of those activities in the context of natural and anthropogenic stressors. For example, devices used by wind energy developers for geophysical and site characterization surveys can generate sound that may affect a marine mammal’s behavior (e.g., habitat use) and may lead to more serious consequences (e.g., stranding). Additionally, impact pile driving during construction of meteorological towers and wind turbines can generate sound that is detectable up to 40 km from the source. Depending on the size of pile driven and the type of pile driving hammer used, pile driving could impair hearing in marine mammals at close range and lead to changes in behavior at greater distances, including temporary or long-term displacement. For example, studies during construction of wind farms in Germany have indicated avoidance of pile driving activities by harbor porpoise as evidenced by a decrease in vocalizations in the study area. In other cases, construction activities may cause changes in marine mammal species composition. Surveys of harbor and grey seal haul-out areas located within 2 km of a U.K. wind farm showed a decrease in the numbers of harbor seals and an increase in the numbers of gray seals hauled out during the five years of construction of the wind farm. Harbor seal numbers did not increase to pre-construction levels after construction activities ceased, which was linked to increased vessel activity and competition by grey seals. Sound generated from operating wind turbines is of lower intensity than pile driving. Although poorly studied, the impacts from wind farm operations are expected to be less severe as well. In at least one area, harbor and grey seals appear to use wind turbine structures to increase foraging opportunities. Increased vessel activity associated with construction of meteorological towers, deployment of meteorological buoys, and construction and operation of wind turbines may contribute to disturbance and increase the risk of vessel strikes on marine mammals. Pile driving, anchoring of wind platform structures, and laying of transmission cables has the potential to temporarily or permanently disturb benthic habitat and marine mammal prey species. Cables transmitting energy generated from wind turbines to land-based facilities generate electromagnetic energy, which may be detectable by certain marine species, including marine mammals, but little or no adverse impact is expected. Sections 101(a)(5)(A) and (D) of the MMPA provide a mechanism for the National Marine Fisheries Service (NMFS) and the U.S. Fish and Wildlife Service (FWS) to authorize the incidental, but not intentional, taking of small numbers of marine mammals by action proponents, such as renewable energy developers. Takes may be authorized provided they would be (1) small in number, (2) have no more than a negligible impact on marine mammals, and (3) have no unmitigable adverse impact on the availability of marine mammals for subsistence uses by Alaska Natives. Take authorizations for renewable energy activities, including wind farm development, typically include a suite of mitigation, monitoring, and reporting measures with which operators must comply to prevent or reduce the adverse effects of those activities on marine mammals. Mitigation measures to reduce the potential impacts to marine mammals from sound associated with site assessment activities (specifically high resolution geophysical surveys) are similar to those used for seismic surveys and include establishing site-specific exclusion and harassment zones and gradually increasing the sound source to alert marine mammals that may be in the area. Mitigation measures for impact pile driving may include reducing pile driving power or delaying pile driving if marine mammals approach closely enough to be injured, and prohibiting pile driving during nighttime or low visibility conditions. Additional mitigation measures for pile driving may include using sound attenuation devices (e.g., bubble curtains, cofferdams, double-walled shields/piles) and “soft-start” procedures (same as ramp-up) at the beginning of each pile installation. Site assessment or pile driving activities may also be prohibited in sensitive areas at specific times. Support vessels represent an increased risk of vessel strikes, and hence may be required to slow down in certain areas or within set distances from marine mammals. Monitoring and reporting measures for site assessment and pile driving activities would be similar to those required for oil and gas operations. The federal leasing process for offshore wind farms is under the jurisdiction of BOEM, which conducts leasing for commercial development of wind energy sites in stages. During the planning stage, states can request that BOEM establish a regional task force comprised of federal, state, and tribal representatives to identify potential lease sale areas that BOEM then uses as the basis for its proposed lease area. Once BOEM identifies a potential lease area, it assesses competitive interest in leasing the area. Alternatively, an applicant can submit an unsolicited lease request. When more than one qualified applicant is interested in competing for a lease, BOEM will hold a lease sale (auction). When only one applicant expresses interest, BOEM will issue the lease non-competitively. Once a lease is issued, developers must provide BOEM with a site assessment plan and/or a construction and operation plan within a certain timeframe. Site assessment plans must describe proposed activities to test technologies or assess physical resources (including plans for the construction of meteorological towers or the deployment of meteorological buoys), and must include relevant data from geological and geophysical surveys, baseline environmental surveys, and archaeological surveys. Once the developers are ready to install wind turbines, they must submit and obtain approval from BOEM for their construction and operation plan, which also must include conceptual plans for decommissioning. 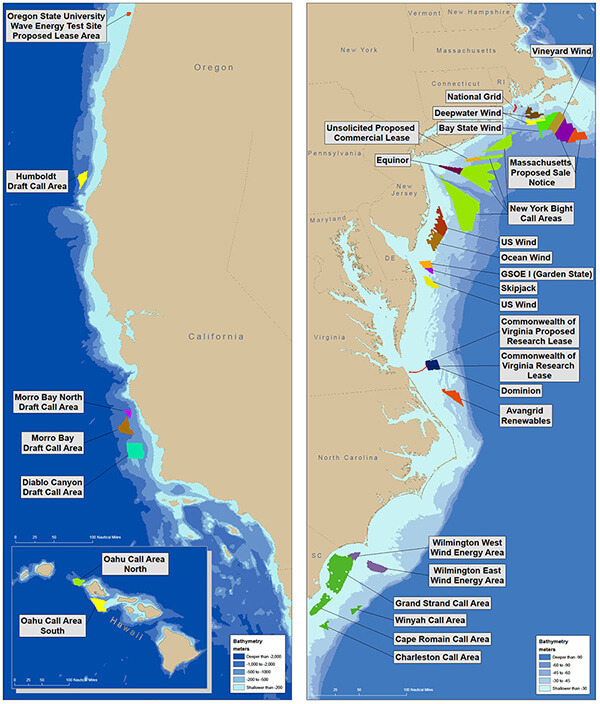 BOEM has developed a series of national and regional guidelines for renewable energy development, including guidelines for providing information on marine mammals and sea turtles in conjunction with site characterization surveys conducted on the Atlantic OCS. Wind energy development in state waters (generally within three nautical miles of the coastline, with some exceptions) is regulated by individual state agencies and follows state processes. State processes may include the establishment of task forces or other advisory bodies to assist in the identification of potential wind development areas. States also may require baseline studies or the collection of other information needed to determine potential environmental and socioeconomic impacts. Wind energy developers in state or federal waters undertaking site assessment or construction activities should consult with NMFS and/or FWS regarding the need for a marine mammal incidental take authorization (see above for information on incidental take authorizations and what the Commission is doing). Hydrokinetic energy is generated from the movement of water (e.g., tides, waves, and currents). Although only a handful of hydrokinetic operations (most based on tidal energy) are generating reliable energy worldwide, several prototype projects are in use or being tested in the U.S. Pacific. 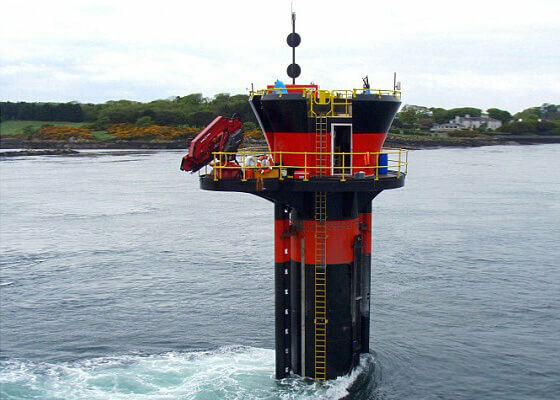 Tidal energy generators are the most common type of marine hydrokinetic device, primarily because of the predictable nature of tides. 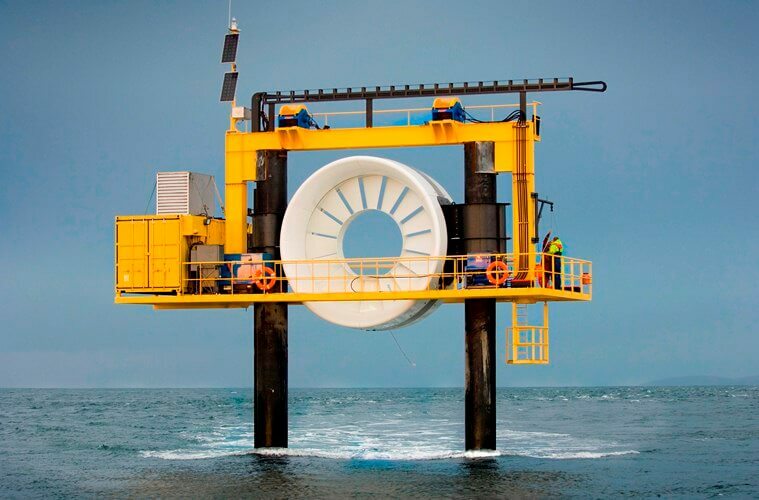 Wave energy devices are generally installed at or near the ocean surface and convert energy from the up and down movement of waves rather than the ebb and flow of the tides. Current generators are the least advanced of the hydrokinetic technologies; underwater turbines or water-wheel structures are the most common devices being tested. The potential impacts of commercial-scale hydrokinetic energy projects on marine mammals and marine ecosystems are poorly known. Impacts are likely to vary based on the design of the hydrokinetic device, its placement in the water column, the presence of moving parts, the anchoring or mooring system, the size of the project, and the species present. If the structure were to be mounted on the seafloor, bottom surveys may be needed to characterize subsurface structure and pile driving may be required to mount the structures, with potential impacts on marine mammals from the sound generated. Underwater turbine foils have the potential to injure marine mammals from collisions with moving parts. Wave attenuators or over-topping devices to capture wave energy may present entanglement or entrapment hazards to marine mammals. As with wind energy, support activities associated with site characterization, construction, and maintenance of hydrokinetic energy devices may result in an increased risk of vessel strikes, habitat degradation, and impacts on marine mammal prey. 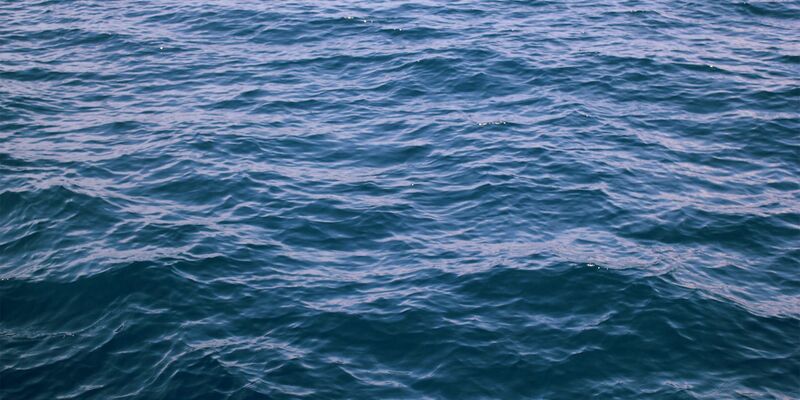 In general, more research and monitoring of hydrokinetic devices is needed to address key data gaps and evaluate the potential risk of individual hydrokinetic energy project to marine mammals. Marine mammal incidental take requirements and associated mitigation, monitoring, and reporting requirements under the MMPA would generally be similar to those for wind energy projects. Measures to prevent interactions, including interactions with underwater turbines, could include deploying acoustic deterrent devices, increasing the underwater visibility of the blades, shielding the turbines, and/or reducing sharp edges. Ideally, such projects would be sited well away from areas inhabited by vulnerable populations. Monitoring should be designed to establish baseline conditions prior to any project activity, using recognized and consistent monitoring methods. Leasing of hydrokinetic energy sites is regulated either by BOEM (for federal waters) or individual states (for state waters). BOEM follows the same process for leasing and limited leasing of hydrokinetic sites as for wind energy. Licensing of hydrokinetic energy is under FERC’s authority. BOEM and FERC have issued guidelines on regulation of marine and hydrokinetic energy projects on the OCS to clarify jurisdictional responsibilities for leasing and licensing of those projects. As with wind energy, hydrokinetic energy developers in state or federal waters undertaking site assessment or construction activities should consult with NMFS and/or FWS regarding the need for a marine mammal incidental take authorization (see above for information on incidental take authorizations and what the Commission is doing).